Rocks…there is no shortage of them up here and our mountain range looks to be aptly named. We have been cleaning up around the edges of some tree islands ahead of the vegetation management project scheduled to begin later this month. When many of the trails were first constructed, several boulders uncovered during the creation of these trails were pushed into adjacent tree islands. With some of these zones planned for thinning, we are working to clean up a few of these locations. 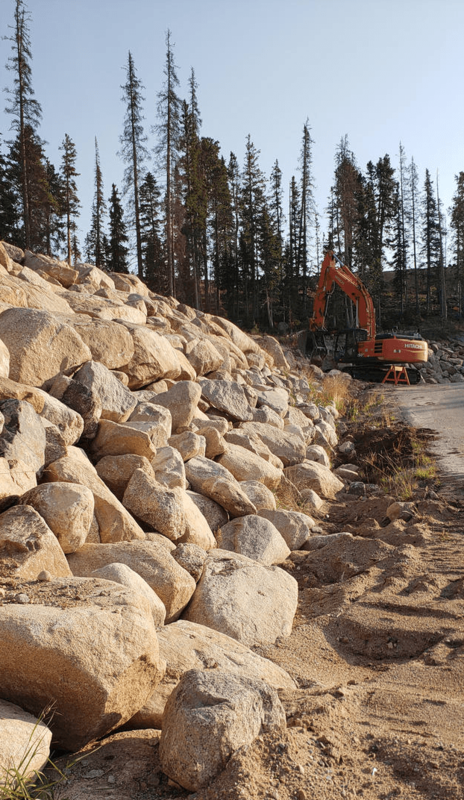 We have also uncovered many boulders while grading the tubing park. Base area projects in recent years created some cut-banks around our roads and parking lots. These areas were matted and seeded after the initial grading work. We are utilizing these rocks to further shore up these cut-banks. We will continue to work on this over the next few summers as the timber project progresses and more rocks are uncovered.